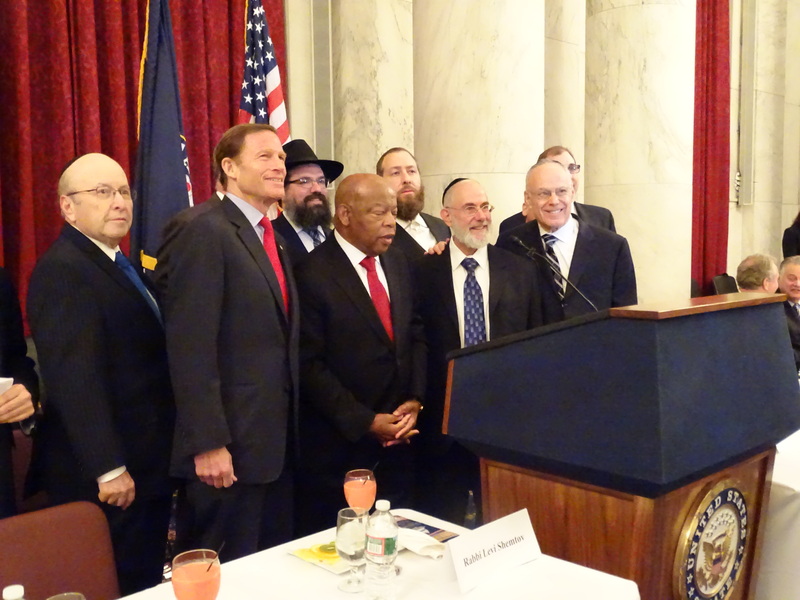 Rep. John Lewis (D-Ga.) and Sen. Richard Blumenthal (D-Conn.) join Rabbi Levi Shemtov and other dignitaries in a tribute to American Jewry May 20. 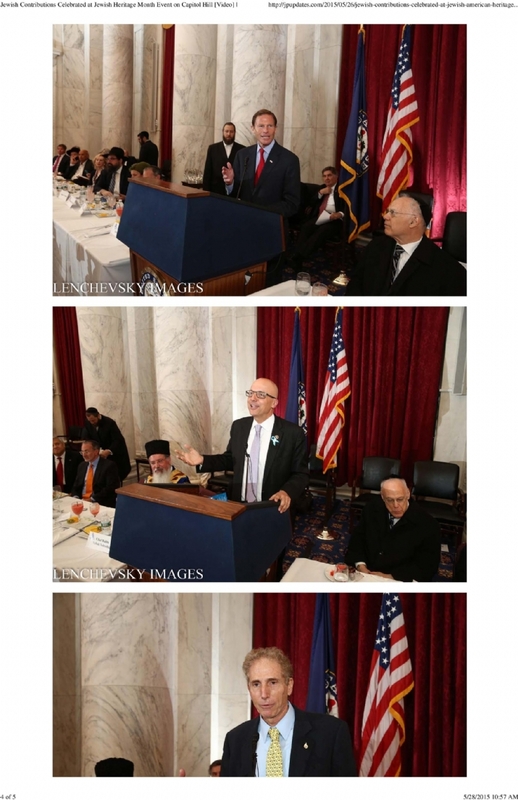 Members of Congress seemed eager to outdo each other’s support for Israel and their own efforts to stop Iran from obtaining nuclear weapons during a recent Congressional tribute to American Jewry. Sen. Ron Johnson (R-Wisc. 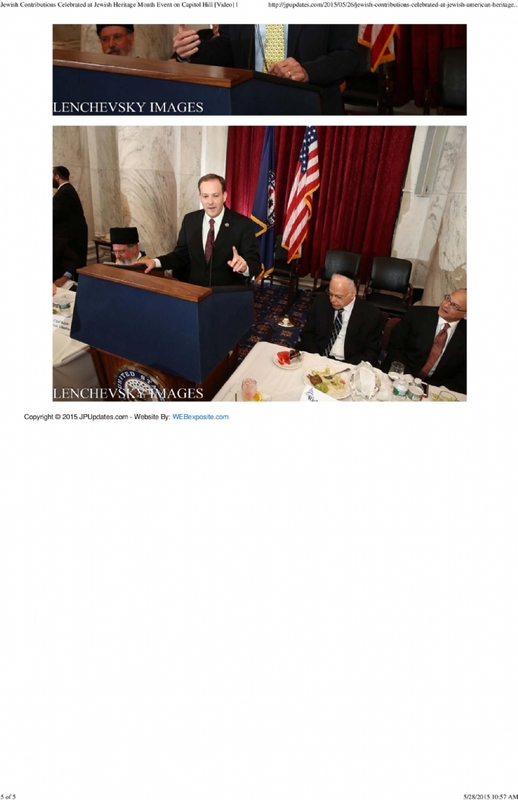 ), said that “we cannot allow Iran” to have a nuclear weapons program. He said the ongoing talks between Iran and the United States will put “Iran on the path to having one. We need to prevent that.” Johnson said he can’t “for the life of me” understood why the countries surrounding Israel don’t work to emulate its democratic ways. The security information shared between the two countries “is absolutely critical to the security of the United States,” said Kelly, who is a member of the Armed Services committee. 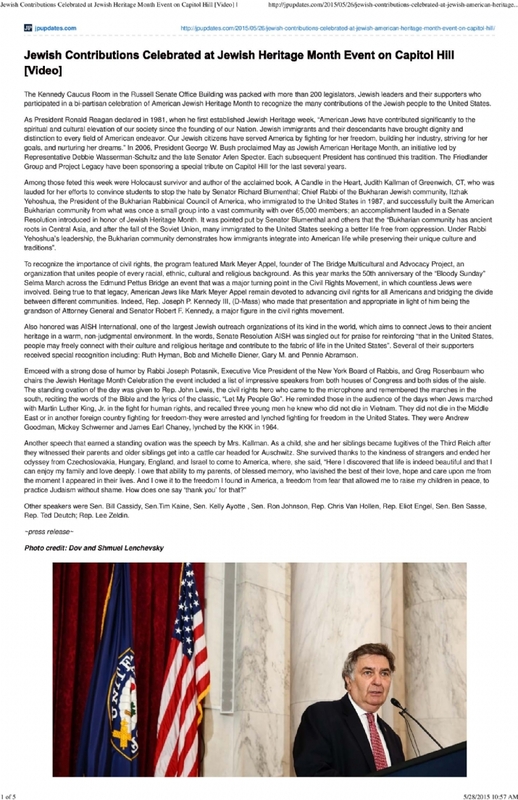 The two-hour event in the Russell Senate Office Building was coordinated by the Friedlander Group, a public relations organization, and arose from Senate Resolution 174, which recognized May 2015 as Jewish American Heritage Month to honor the contributions of Jewish Americans in the United States. 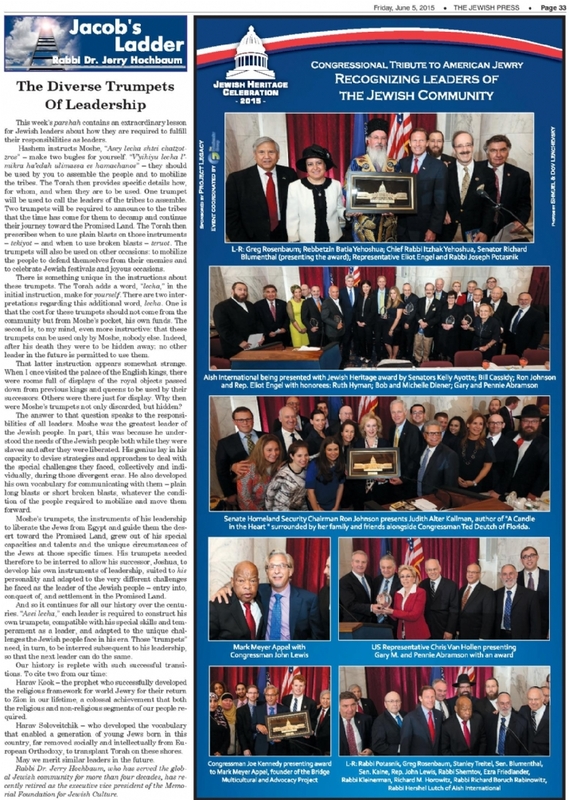 Eating a kosher meal in the Senate building shows how far the Jewish people have come, said Rabbi Levi Shemtov, executive vice president of American Friends of Lubavitch. The White House kitchens for both presidents George W. Bush and Barack Obama have been “glatt kosher, totally,” he said. Honored at the event was Judith Alter Kallman, a Czechoslovakian immigrant who was hidden as a child during the Holocaust. Hers “is a story of sadness and mourning, and it is also a story of happiness, the happiness of my family’s triumph” over evil, she said. 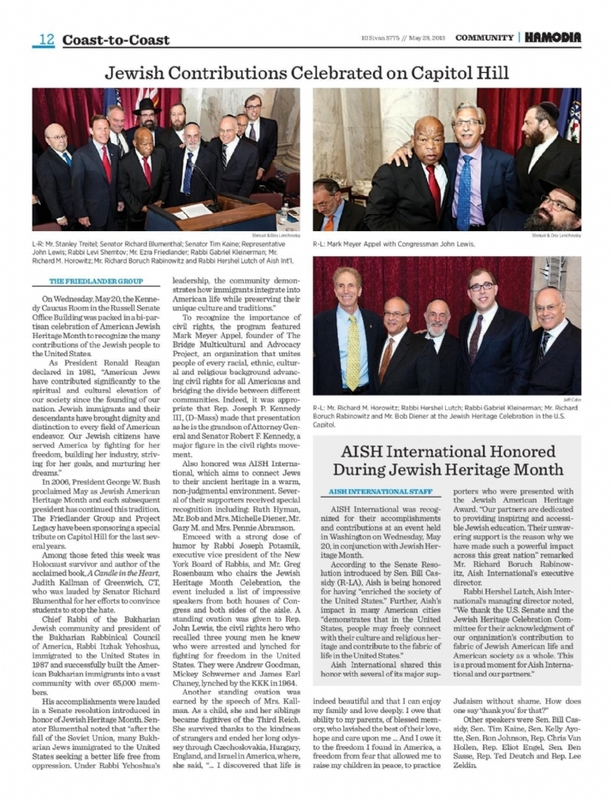 Also honored were the Jewish outreach organization AISH International; and Mark Meyer Appel, for his work advancing civil rights as the founder of the Bridge Multicultural and Advocacy Project. 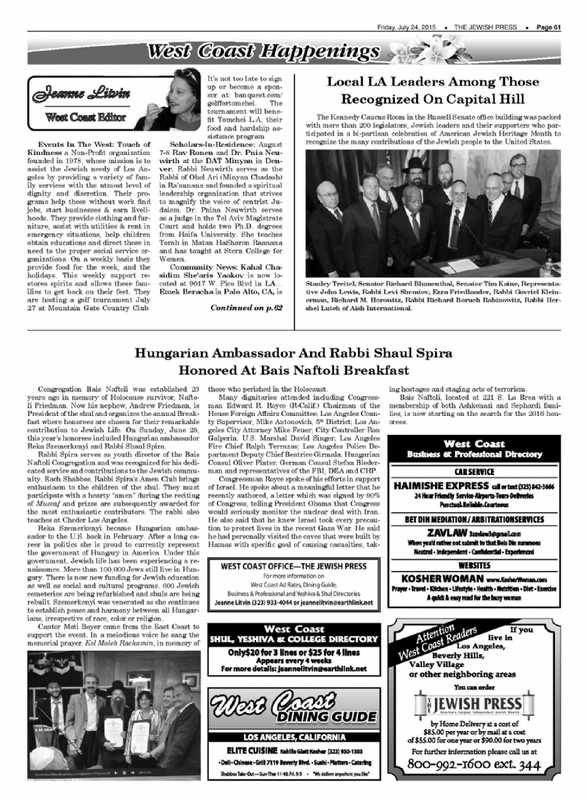 Jewish people have been involved “in the pursuit of justice throughout America’s history,” he said. Rep. John Lewis (D-Ga.) recalled that not only African Americans, but Jews, and more specifically, rabbis, marched and were jailed during the struggle for civil rights. 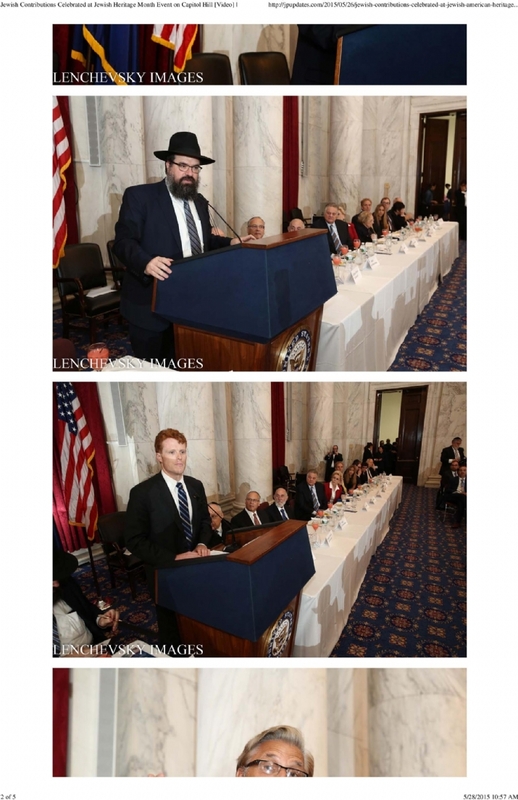 Other officials attending included Rep. Joseph Kennedy III (D-Mass. 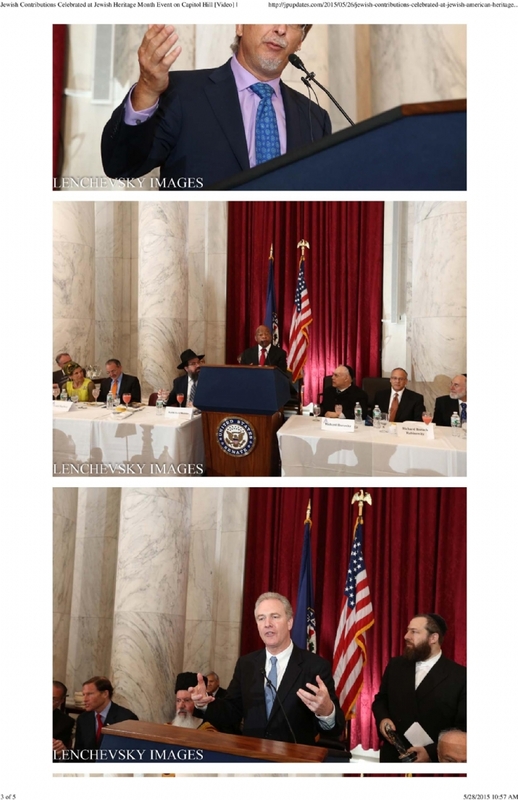 ), Sen. Tim Kaine (D-Va.), Rep. Eliot Engel (D-Va.), Rep. Ted Deutch (D-Fla.), Sen. Ben Sasse (D-Neb.) and Sen. Bill Cassidy, (R-La. ).